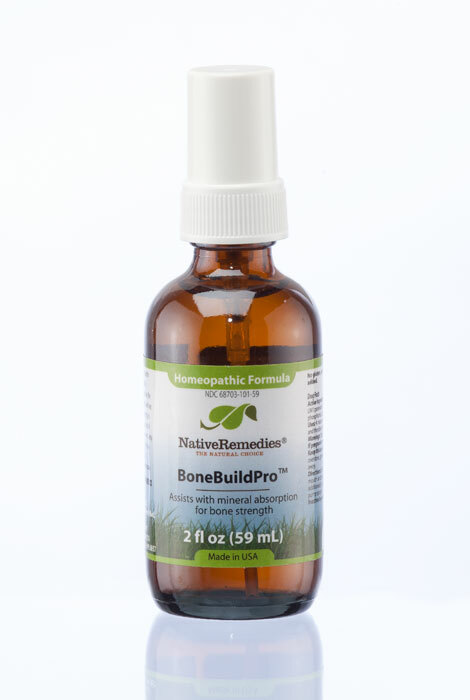 Helping relieve pain and promote healthy bones, NativeRemedies® BoneBuild Pro™ temporarily eases joint and bone pain while boosting mineral absorption to support bone strength. Offering support for malnourished, fragile bones, this natural bone and joint supplement helps restore balance at a cellular level. The 100% homeopathic ingredients are selected to provide ongoing support and pain relief without the risk of addiction or side effects. Like all Native Remedies formulas, this bone health supplement is manufactured in an FDA-registered and cGMP-compliant pharmaceutical facility in the USA, under supervision of expert herbalists, naturopaths, homeopaths and responsible pharmacists. A taste-free remedy in a pure water base, it’s easy to ingest; simply spray directly into mouth. Use 3 times daily, and additionally as needed or until symptoms improve. 2 fl. oz. *These statements have not been evaluated by the Food and Drug Administration.